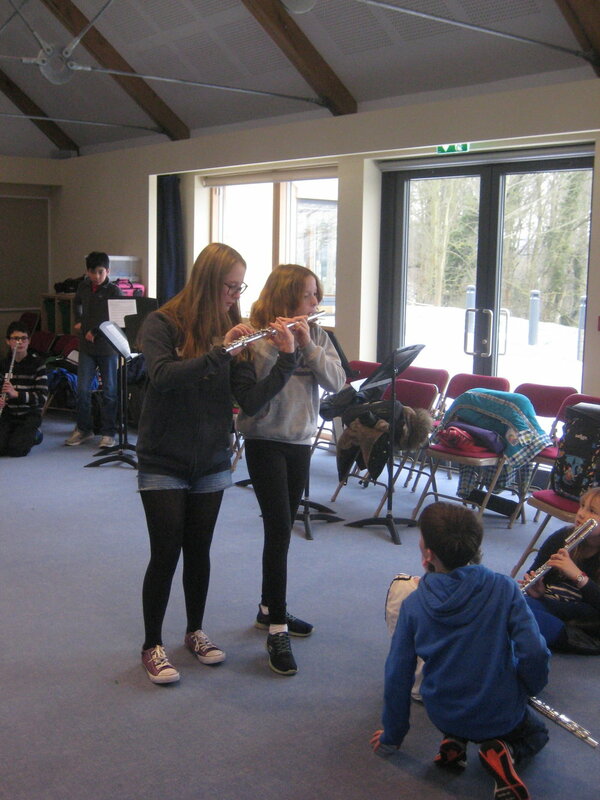 Flutewise at Woldingham 2018 and CAKE! 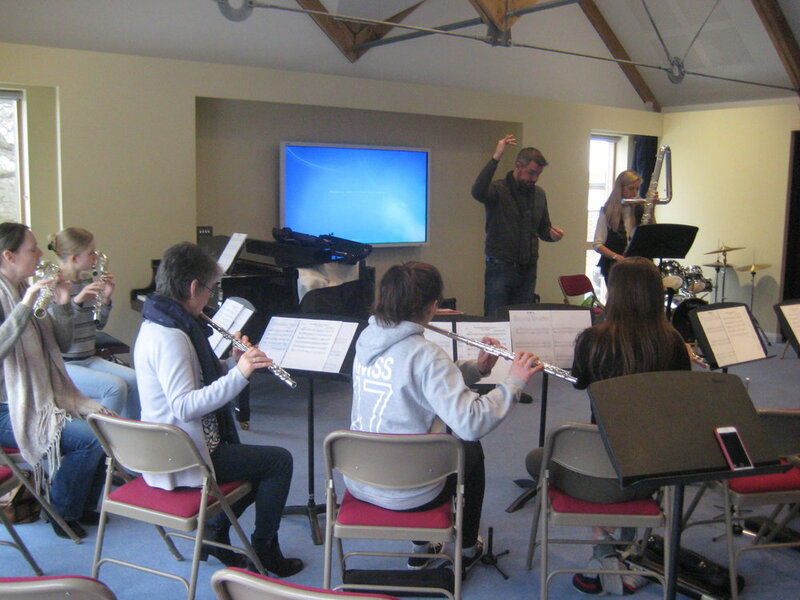 I'm just recovering from another great Flutewise course at Woldingham. As always we had wonderful course members, house staff and visiting staff and everything about our stay at Woldingham School was really good. My highlight has to be the CAKE! It's hard to believe I set up Flutewise 30 years ago. That was even before many of the members of staff on our course were born. I hope I can manage another 30 years! I love the cake has a flute on the top, but more importantly I love the photos around the edge, showing events from Flutewise past. More photos below. We had so much fun on the course. It was a slightly different one to normal with visiting staff each day. This meant our ensemble pieces and warm ups weren't as intense as normal. There are only so many hours in a day and we really did fill them. The house staff included Simon Williams, Lorna Brown, Joleigh Saunders, Abbie Burrows and Carrie Hensel. 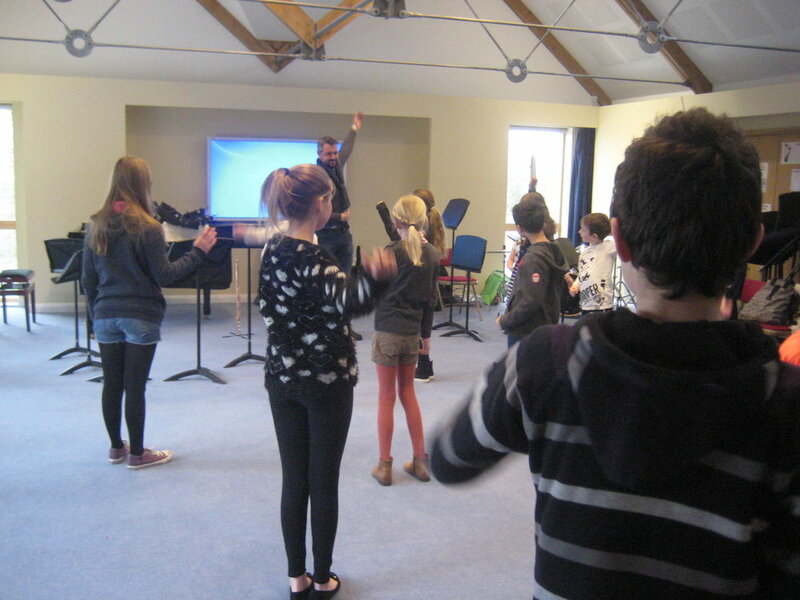 On Wednesday we were joined by pianist and ABRSM examiner, Chris Baxter, he stayed with us for the rest of the week. Carolyn Kelly also joined us on Wednesday as did Pasha from Just Flutes - he talked about flute care and brought us goody bags (a huge thank you Pasha and Just Flutes). We had a very special guest for the afternoon and evening, Philippe Barnes who performed for us and taught us loads about Irish Flute playing. On Wednesday morning we had an 'Ensemble Competition'. It was an 'unfair' competition as 2 of the ensembles had already been rehearsed before the course. It was really good to see and hear people really working hard and focusing, trying to win. Each group even had to design and make a programme. The performances were all great and, in true Flutewise fashion, everyone won - equally. The prizes were very well received - a cabbage, a swede, a cucumber, a bag of carrots! What more could anyone want?! I’ve got video recordings which I will sort out soon. Thursday was dedicated to everyone working on their own solo with piano accompaniment with Abbie and Chris. Later in the day we had a student concert. I was really impressed with the difference in playing from the morning to the final performances. Every single person took on board what they should do to improve their piece. Again, they were recorded and I’ll sort them out as soon as I can. Gareth McLearnon was with us on Thursday and as well as working on The Flutewise Theme which he composed, he also brought his enormous collection of flutes for a ‘show and tell’ session and he worked with the more advanced players on technique. 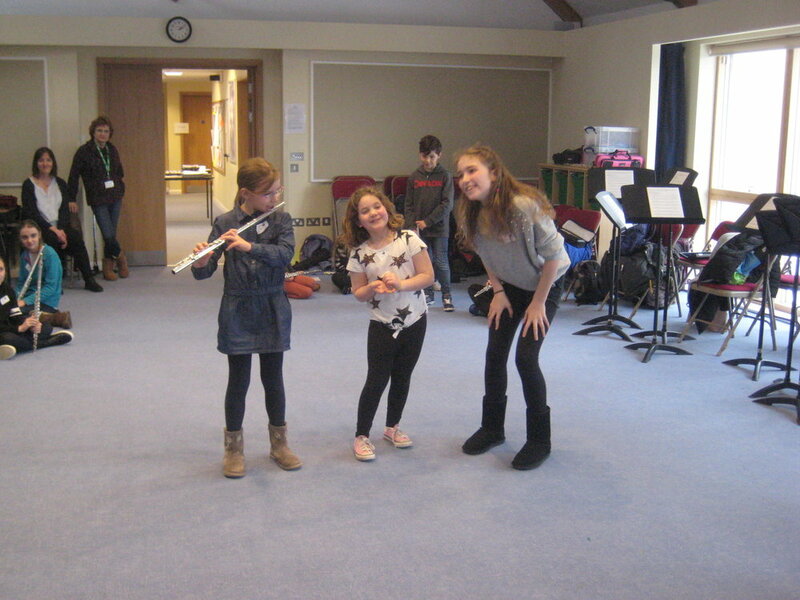 We had 2 girls training as Flutewise Apprentices, Jess and Pippa. I’m so very pleased they are on board. As part of their training they had a to run a workshop creating a piece using a poem. The results were lovely. Again there is video to come. I was very much looking forward to Friday as we had Rachel Brown come along and share lots of information about playing Baroque music. Rachel is such an expert and so very good at making it all easy to understand. There were lost of other things happening during the course - workshops on circular breathing, piccolo playing, vibrato, we had a ceilidh (that’s a bit of Scottish dancing) and every night we had a relaxing bedtime concert. There are photos below but there will be lots more soon. Also there is an email from the mum of one of our course members, she is happy I share it with you. I just wanted to say a huge thank you for Flutewise at Woldingham, Layla had a fantastic time. It's always a bit of an unknown quantity sending a child on a course - most of the time they can only give you a vague account of what they ate, who they met and that's about it. But in the case of Flutewise, Layla spent the journey home (for a good couple of hours due to the M25 being a bit busy) giving us a detailed account of what she learnt about playing high notes on her flute and piccolo, what she learnt about looking after her flute, the technical exercises she did, the pieces she enjoyed playing, how great the teachers were, how she was inspired by the apprentices, how much she enjoyed the ensemble competition, how good the evening concerts were, and how much she loved her medal and gifts. So I can wholeheartedly say that Flutewise is worth every penny, is a fantastic opportunity for a child, and that we'll definitely be back. THANK YOU! I loved every aspect about Flutewise: the solos, the ensemble competition, the choir, the staff, and the food! However, most importantly, I made new friends and had a fantastic time!! 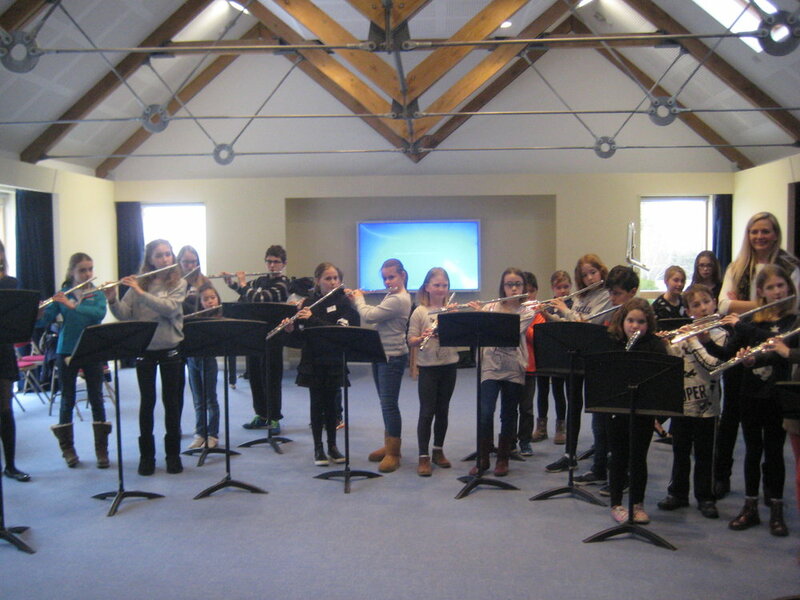 Flutewise in Tonbridge - we did it! Over 30 years of Flutewise I've faced all sorts of challenges with events. Our day at Tonbridge gave me a new one - snow! We were due to have the event on 4 March, but the school closed the venue because of the snow. Luckily we managed to reschedule the vent for the 18 March feeling very confident the weather would be fine by then. We had a few days of lovely spring weather and then more snow! It wasn't quite as bad this time so we could go ahead. The event was held at the Schools at Somerhill in Tonbridge, a lovely venue. It's with a big thanks to Pat Daniels for making this happen every year. The morning was a BFS workshop for adults with Abbie Burrows and Gareth McLearnon. Patrick Onn also came along with his travelling flute shop. In the afternoon it was a fun filled packed Flutewise event. Everyone really seemed to enjoy themselves and learn so many new things about the flute. 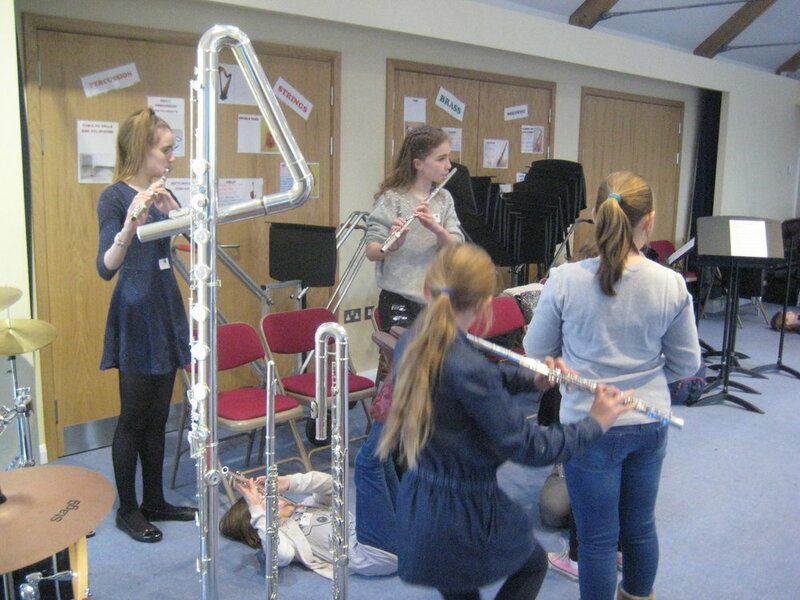 As well as warming up exercises, flute choir playing, seeing Abbie and Gareth's growing collection of amazing flutes, everyone really enjoyed being extremely creative in the Scale Game. As it is Flutewise's 30th anniversary we had cake! Yummy. The day ended with a very short performance to parents. It was really lovely, hearing the music and watching the snow out of the window. Many thanks to everyone who made the day so special. Looking forward to the next one.